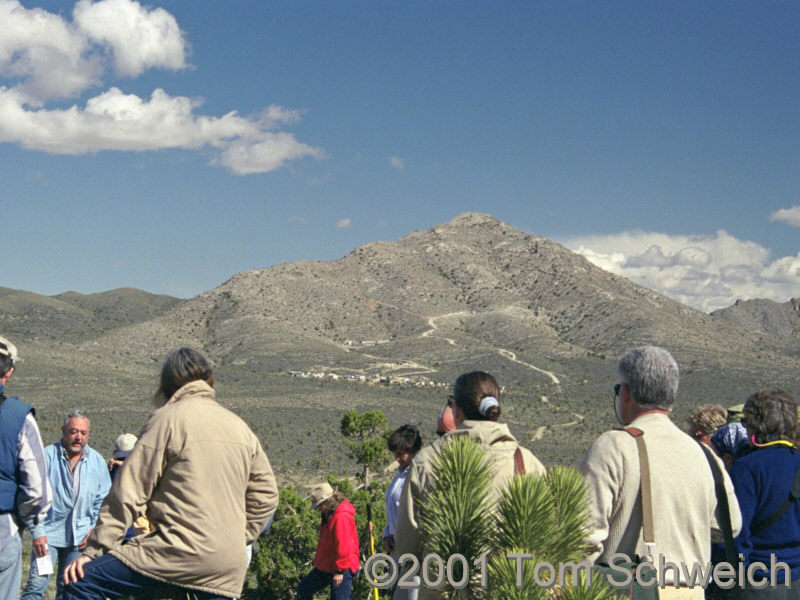 Photograph taken April 21, 2001 during the field trip of the 2001 Desert Research Symposium. The peak of Kokoweef Peak is formed of Goodsprings Dolomite. The outcrop is bounded by the Clark Mountain Fault and extends to the southeast into the Ivanpah Valley. Flanking the north and west of Kokoweef Peak is a series of progressively younger rocks, beginning with the Sultan Limestone and ending with the Aztec Sandstone, upon which this field trip group is standing. Eastern Mojave Geology -- A Botanist's View: Goodsprings Dolomite. Other photos about Geography - Eastern Mojave or Kokoweef Peak.